I have been a fan of this series since I read the first one. This #5 in the series. Alex Duggins is the Main Character. She lives in Folly – on – Weir and owns the local pub. She is in a relationship with the veterinarian, Tony Harrison. Alex’s Mother, Lily plays an important part in this story.The police are Detective Sergeant Bill Lamb and Detective Chief Inspector Dan O’ Reilly. Alex is returning home and sees a fire in a new construction area. Call for help and aids a stranger by putting out the fire burning his clothes. This draws Alex and friends into another major murder investigation. Another thread is with her Mother. Alex vegans to learn about her background. There twists and turns will enthrall you until the surprise ending. I highly recommend this book and series. Disclosure: Many thanks to Severn House for a review copy. The opinions expressed are my own. 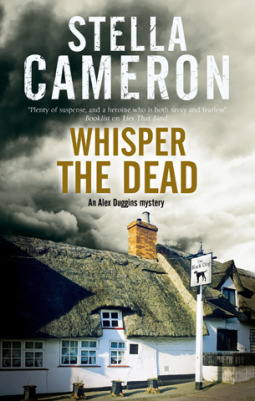 This entry was posted in #NetGalley, Books, Uncategorized and tagged Alex, Cold Case, family, Favorite, mystery, Stella Cameron. Bookmark the permalink. Thanks for sharing your review Betty. I always enjoy reading a good murder story.